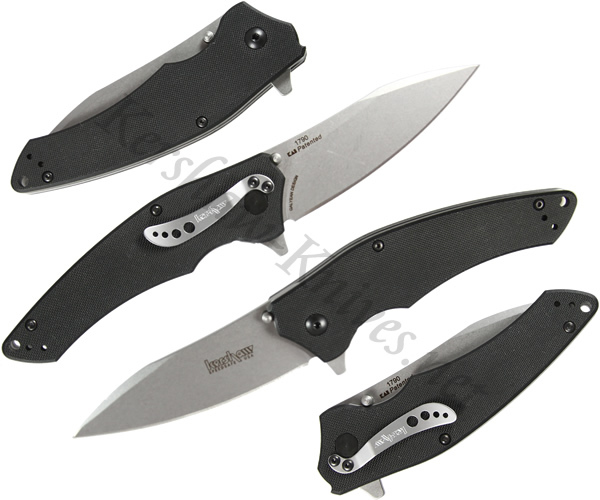 The Kershaw Turbulence 1790 has a modified drop point blade with an upswept design that extends the cutting surface. It is constructed of Sandvik 14C28N stainless steel and features a stonewashed finish. The knife has SpeedSafe assisted opening that is initiated with the dual thumbstuds or the integrated flipper. The blade is secured into position with a liner lock mechanism. The handle of the Turbulence 1790 tapers somewhat toward the back. This allows better gripping of the pinky and ring fingers for better control of the knife. Black, textured G10 scales provide a steady gripping surface.